If you're looking to get into canning, this is the thread for you. 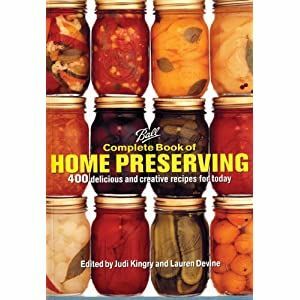 In here I'll go through what you'll need to get started into preserving your own food as well as recipes that you can use. If you get into this, you'll find that the food you preserve yourself is not only better than store bought, but in the long run it's cheaper, even if you're buying some of your raw ingredients from the store. To start off, you'll need some hardware. funnels, not the cheap plastic ones. You can get it in Amazon, at Walmart where they have their canning supplies, I've even seen it at Lowes near the customer service desk. This is your canning bible, it will tell you everything you need to know. You'll also need to start acquiring canning jars. Craigslist has been an excellent resource for me collecting large amounts of jars. Used jars, you probably shouldn't pay more than $5/dozen. If you're buying used jars, you'll also need to get a stockpile of lids and rings to close your jars. Lids and rings come in two sizes, Regular Mouth and Wide Mouth. You'll select the jar based upon what you're canning. You don't want to put pickles inside a regular mouth jar, and there's no point in putting tomato sauce in a wide mouth jar. 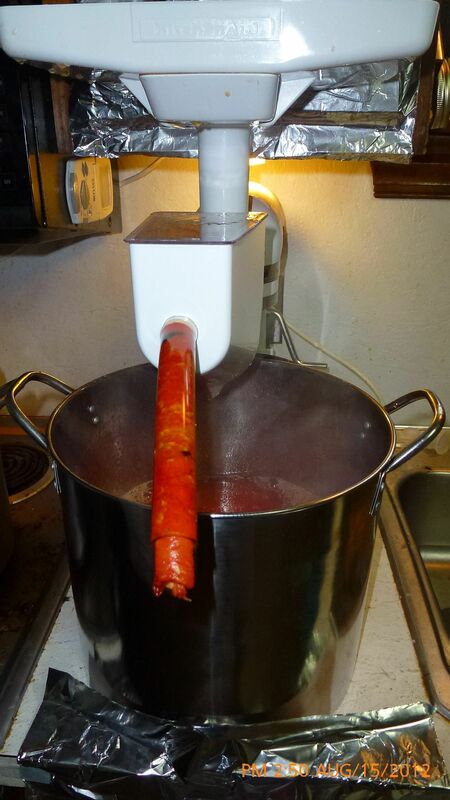 There are beginner sets of canning tools you can pick up rather inexpensively, but if you're going to get into it and do it seriously, do not buy the plastic funnels ladles and other plastic parts. Spend the extra money and get good Stainless Steel tools. You'll be much happier in the long run, as things like Salsa, and Tomato juice/sauce have a nasty tendency to stain plastics. That should be enough to get us started on this, I'll start posting recipes and things that I've canned later. My wife and I were just talking about canning a crap load of jalapeno peppers that will go to waste, otherwise. Thanks for the info! 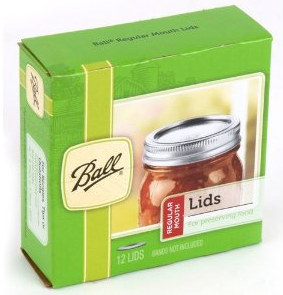 Check out the "tattler" brand of reuseable canning lids. I've been picking up a box here and there. They work well and over the life of the lid should actually be much cheaper to use. The process is a little different with the plastic lids but instructions are included and also available on their website. ColdBlueSteel, proud to be a potential enemy of the state. 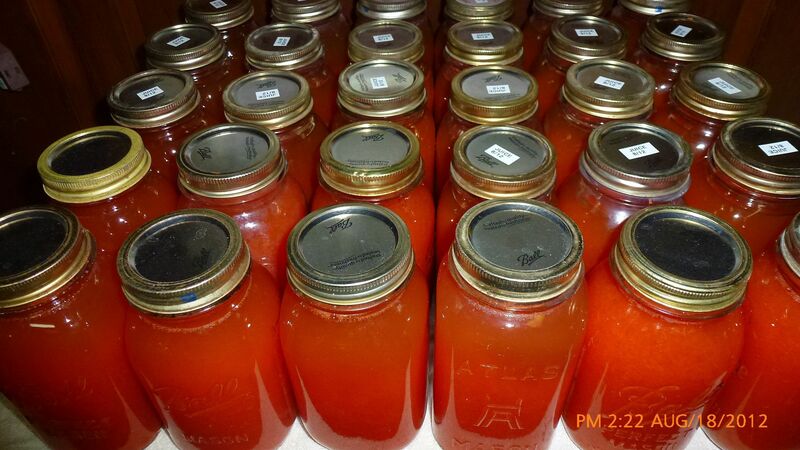 The very first thing I started canning myself was Tomato Juice, not sauce that's seasoned, just the juice. Every two years, I'll buy about 120lbs of tomatoes from a local farm and can them. 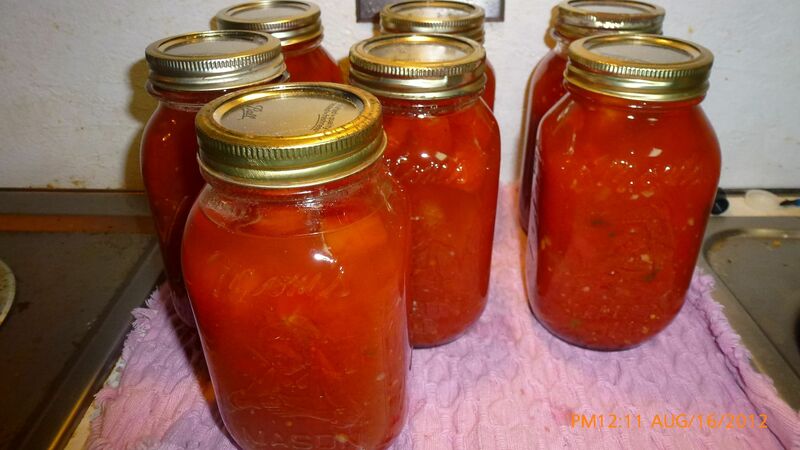 That many tomatoes normally produces between 60 to 70 quarts. This is the first year I decided to actually do sauce as well as juice. 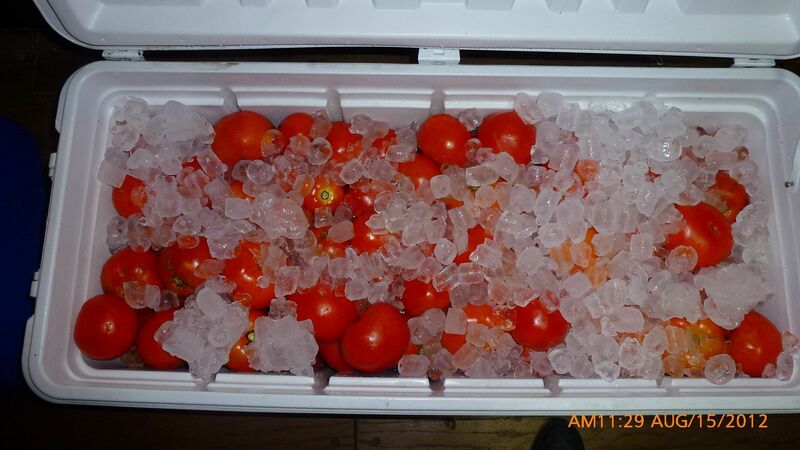 My 120lbs of tomatoes that I picked up from a local farm for a total of $24. I always put them on ice because it normally takes me 3 days to get through the entire load. My extra ingredients for the sauce. I found the #10 can of dice tomatoes at the local restaurant supply store for right around $3.00, I added them to give the sauce some body. The jar on the left is fresh basil and the the other is fresh garlic. 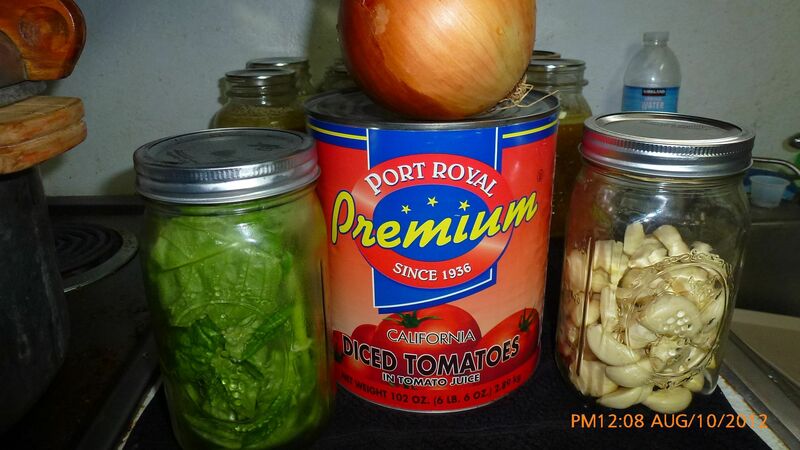 I cooked down two entire 14quart pots of tomatoes, juiced them, and then added these ingredients as well as salt, pepper, a little sugar and bay leaves. First batch of sauce out of the water bath. This is 7 quarts of either juice or sauce being processed in the water bath. Each quart of juice and sauce had a Tsp of canning salt and a table spoon of fresh lemon juice. The lemon juice helps keep the color nice during long term storage. This is the completed batch of juice 40.5 quarts when it was done. This is my juicing setup. I have a KitchenAid stand mixer with the juicing attachment, the first picture is before I started the actual juicing. This is the juice actually being processed. I added a 3/4" clear PVC tube to the waste output of the juicer so that it falls where I want it to. That should be enough to get ya started with tomatoes. One thing I didn't mention is I cored and quartered each tomato before it went into the pot. The juicer removes the skin and the seeds. 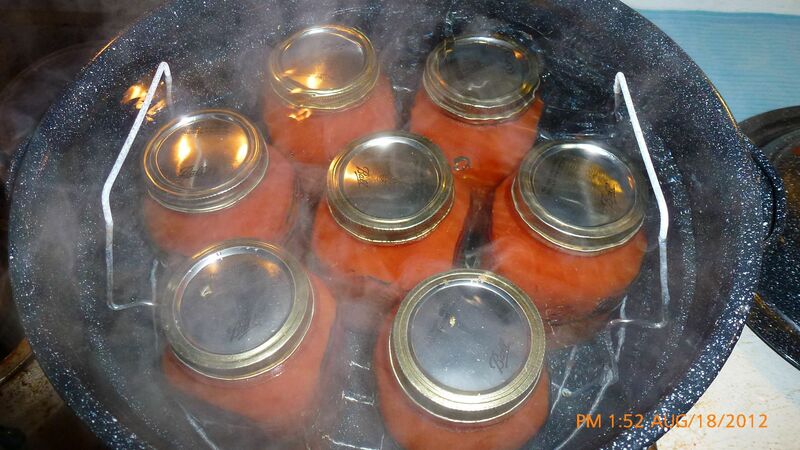 What about canning on a glass top stove, is that impossible? 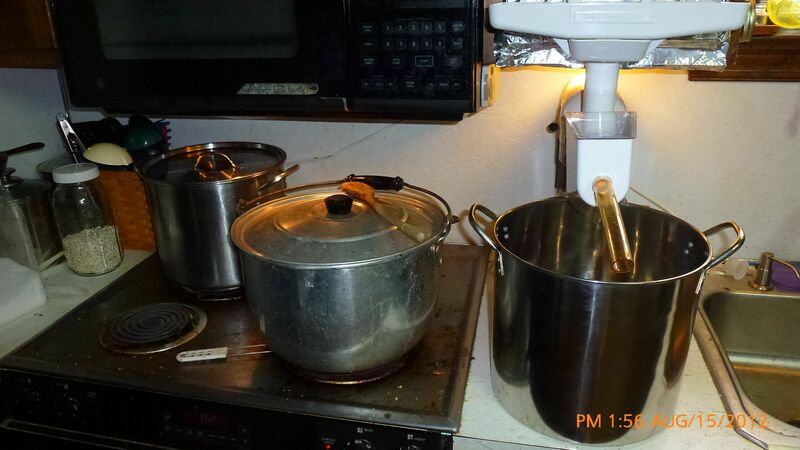 (09-07-2012, 07:33 PM)Camper Wrote: What about canning on a glass top stove, is that impossible? Yes, I believe that you're not supposed to do that because of the combined heat and weight involved. My mother buying a new glass top stove was the impetus for her giving me all her canning supplies, she couldn't do anymore with her bigger equipment. I think all she does now is small batches in a water bath, but nothing with a heavy pressure cooker. When I got done with my tomatoes this year, I had to replace the drip pans on both my larger burners as both of them had deformed from the weight/heat. I'll probably have to do small batches then ifi do anything. I don't want to not do anything, but need to be careful with the stove too. I suppose a hot plate could work, or small electrical elements? Very new, picked up about 18 jars in antique crate at auction for 14' would be a shame to not use them. 4 are the little jelly jars. Ill research this more, I know I won't be alone with glass stoves wanting to can. (09-07-2012, 07:47 PM)Camper Wrote: I'll probably have to do small batches then ifi do anything. I don't want to not do anything, but need to be careful with the stove too. I suppose a hot plate could work, or small electrical elements? The restaurant supply store that I go to near here has some really nice single burner type plates. 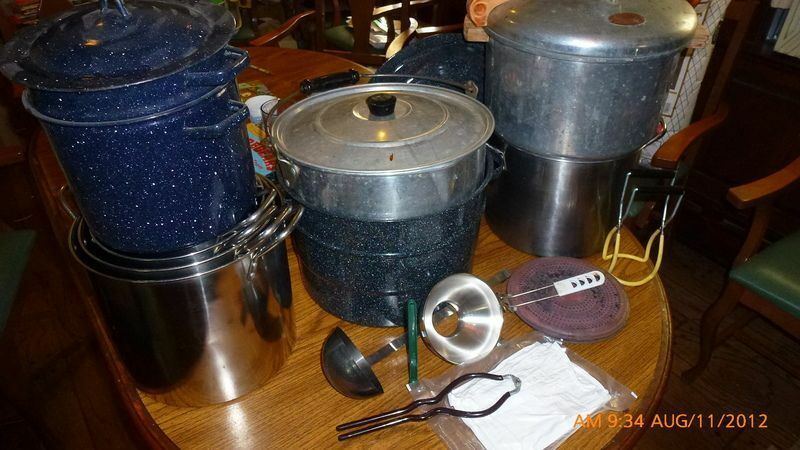 They're large enough for a pressure cooker, and look fairly heavy duty. Next time I stop out there I'll take a look at brand/price for ya. That would be. Awesome, thanks!